Someone once said that we have to reverse the words 'abstract' and 'realistic' when it comes to painting. It is the painting of the landscape we have to call abstract : it strips away aspects from a real scene. A Pollock on the other hand is the realistic painting. There is nothing else but the painting. 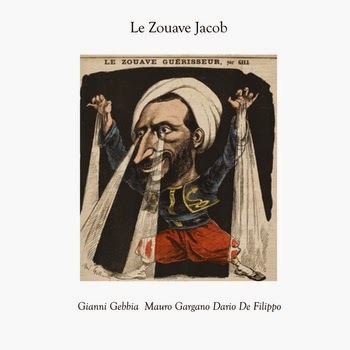 I can see that and when I apply it to these two records of Gianni Gebbia, the Zouave Jacob is the abstract piece, the cello meeting definitely the real piece. During the Second Empire in France, an army musician called Jacob drew Parisian crowds by performing so-called miraculous cures. Not unlike present-day evangelists he went into a trance and used the “Fluidum of White Ghosts” to heal. He seems to have used loud trombone improvisations and barrages of insults to cure the ailing. So when you call your record Le Zouave Jacob, there is a prior image. Around this image the trio plays and what they come up with is something like a soundtrack to a non existing film (not unlike Shadows and Fog). 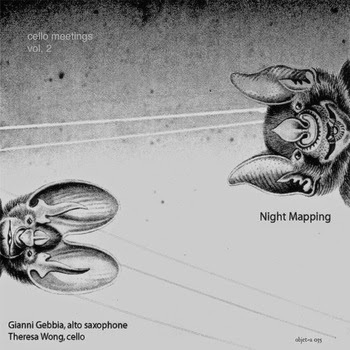 The trio mixes jazz, electronic soundscape, minimalism over a complex polyrhythmic background, staying low most of the time, except in the track called “Guérison”, where you cannot help but hear the loud trombone improvisations. So this is the abstract record. Night Mapping is what it is. Music by two who tap into the never-ending stream and coax out of it a concentrated dialogue, listening, anticipating, proceeding according to its inner logic, providing recognition, alienation and humour (through the use of the crackle box e. g.). You listen through it and when all is said and done (about half an hour, a good length) nothing has changed. Which is nothing to be sneezed at. Gebbia as a practicing zen Buddhist must know this story : Before Zen, mountains are mountains and rivers are rivers. During Zen, mountains are no longer mountains and rivers are no longer rivers. After Zen, mountains are mountains and rivers are rivers. Couldn’t have stated it better . Nothing world shattering here but definitely worth the listen. After listening to music, sometimes something has changed in me, but I can't remember anything ever having changed in the rest of the world as a result. And why should it. Ah, any dictionary definition is just a list of options, and it is a chimera to want an exact meaning.